We call this Sunday the Feast of Christ the King. With a title like that we expect it to be an occasion of rejoicing and celebration. This is the Sunday when we end the liturgical year (the completion of the Church’s story) and prepare to start the story again with Advent Sunday: so from the end of the story we will go back to the beginning. So at this end of the story, we pause and realise that this Sunday is no end but already a new beginning. On this Sunday I find myself conflicted. I murmur the lovely words ‘Christ the King’ and make that a prayer in my heart. It is a cry of longing. 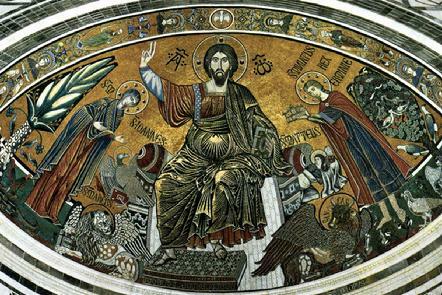 The thought reminds me of a recurring image often found in prominent locations in ancient churches (I think especially of the Eastern Church) Christ pantocrator – it represents Christ as the creator and sustainer of the universe. To encounter the image is quite startling – it crosses a cultural threshold; a spiritual and imaginative threshold. This is Christ in glory – beyond the scope of time. It is unspeakably bold in conception and, when I saw it in Hagia Sophia, the ambiguity of it wrung my heart as, on each side of it, were the huge calligraphic panes that bragged of an Islamic conquest. And yet the cry of longing remains: I remember Christ’s caution (John 18:36) “My kingdom is not of this world” and I continue to pray “your kingdom come”, even in Hagia Sophia, this magnificent edifice to faith, desolation and loss. So, I continue to be conflicted: on the one hand the image of Christ pantocrator, creator and sustainer of the universe, and, on the other hand our human condition, finite, troubled, uncertain. How might we image our condition? I stumbled across this. 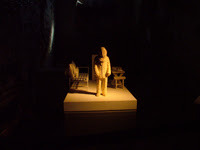 It is a photograph of a sculpture by the artist Susan Hagen and it is called ‘Recollection Tableaux: Inmate shortly after processing’. The situation is quite unique: it is from an art exhibit at the Eastern State Penitentiary, Philadelphia, PA. The exhibit depicts scenes of prison life in plaster sculptures. In the photograph the sculpture is brightly spotlit but surrounded by darkness. The image is disturbing; it is a lone figure, hooded and in a prison uniform; everything in this image speaks of alienation and dislocation, of a process of dehumanisation; of subjection to a systematic assault that makes one feel lost, without dignity, without identity and utterly helpless. Even the title shocks me: ‘Inmate shortly after processing’, here is someone rendered as an object not a person; referred to as an ‘inmate’ and subjected to a ‘process’. But in ‘Inmate shortly after processing’ I recognise myself, and all of us, bound in our human predicament, – bound in our humanity, vulnerable and blind. More than this, I also start to discern in this bound and hooded figure the helpless Christ of the Passion; the incarnate one who shares our flesh and our predicament; the one who is humiliated, mocked and reduced by the powers and authorities of this world. “25:37 … 'Lord, when was it that we saw you hungry and gave you food, or thirsty and gave you something to drink? On this Feast of Christ the King we rehearse and spell out the difficult grammar of salvation. In the image of ‘Inmate shortly after processing’ we recognise ourselves and our predicament and holding that, in the manner of the watermark on our paper, we faintly discern the image of Christ Pantocrator, the one who is creator and sustainer of the universe. Dear Lord, your Kingdom come.